While we at iJailbreak don’t think that Apple’s App Store should be the only choice for downloading apps, truth be told, I’ve had very few personal negative experiences with App Store. That said, there are issues with the store that we are all too happy to address. There are apps that leak sensitive user data without approval, apps can be removed seemingly at Apple’s whim (For examples of both, see Clueful). A new form on Apple’s legal site seems to be an attempt to address these problems with an increased degree of transparency. In the past, the process of taking down content from the iTunes store seemed arcane. We still don’t have a clear idea of what will and will not be tolerated on the App Store, but now we can take a peek at some clues in the iTunes Content Dispute form. 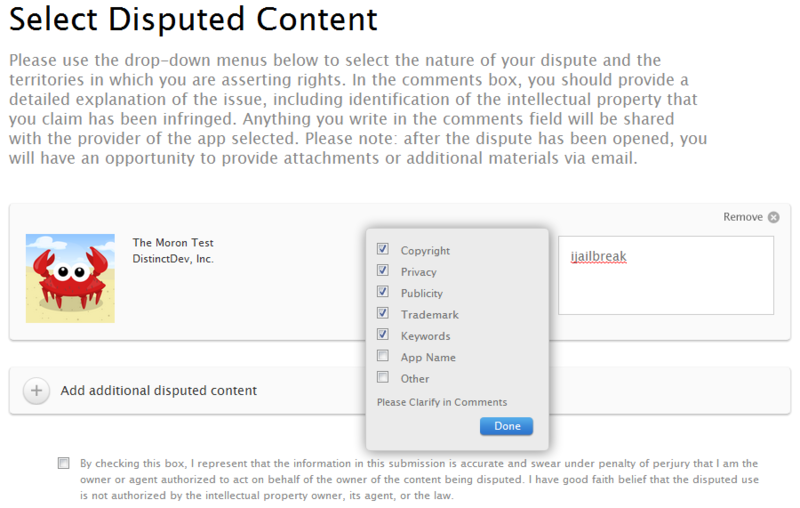 The Content Dispute form seems to be designed with intellectual property disputes in mind, and can be submitted online by anyone with a phone and an email address. If you are a developer or other content owner, you can select an infringing or otherwise damaging app by search or URL. Afterwards you can select the reason for the dispute, and then add additional details (as well as other documents). What I like is that the details of why the app is disputed will be shared with the app’s developer. This way the developer should know that there is a complaint about the app and may hopefully have a chance of appealing or resolving the issues. 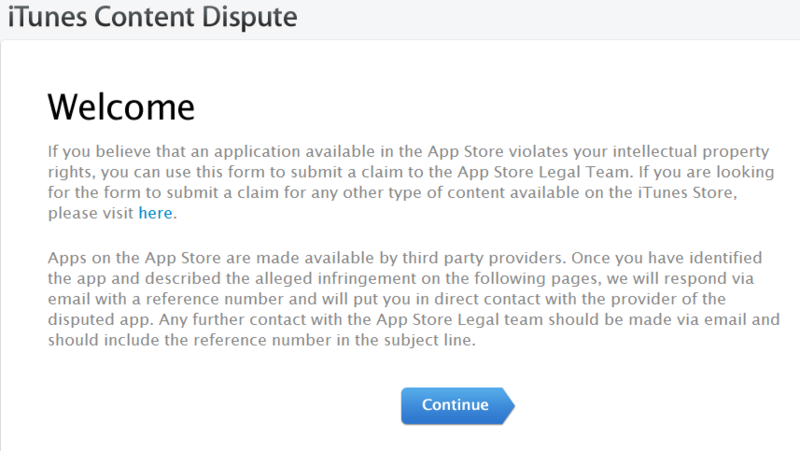 This is an emerging benefit of the App Store: smaller developers won’t need to be well connected or have a well-paid legal team to have their rights honored in Apple’s store. All they need to do is fill out an online form. What’s curious is that in addition to the usual IP rights of Copyright, Publicity, Trademarks, Keywords, and App Name, there’s also a box for Privacy disputes. Perhaps Apple is putting personal data under the umbrella of intellectual property? While the form seems to be intended for companies, it would be interesting to see if this could also be used by the public to take down apps which wrongly access private data. How else can Apple improve the App Store? Share your thoughts in the comments section below.